This review assumes a basic understanding of the appropriate technology. Reviewed October 2004. On the right. The rounded style of the talkie walkie 2 way radio and its stubby little aerial. slip into a charging pod. We just had time to charge the PMR 2 way radio batteries overnight before we were off on our 2003 Devon holiday next day. We decided to use channel 7, picked a CTCSS code at random and set both talkie walkies to these. Then we quickly learnt the phonetic alphabet - Alpha, Bravo, Charlie, Der, er, oh, that's not right, o well, let's forget the radio babble then! Although they're often referred to as 2 way radios, in fact many users can communicate provided all the units are set to the same channel and CTCSS code. Unlike a mobile phone, only one person can talk at once, ie one way at a time. Above. The talkie walkie signal faded out once round the headland on the other side of the beach seen above. Safely back from holiday we decided to test the actual distance we could communicate with the 2 way radios. We started off at our home, Belinda walked towards the village centre (picture right) while Mike walked in the opposite direction. It wasn't long before reception got patchy and we lost touch. On our return home we plotted the distance achieved on the map and it turned out to be barely 1 km, a third of the quoted range. Now, although built-up we hardly live in the great metropolis so were rather disappointed with this. But to balance this we also took the talkie walkies up our local hill on the South Downs, and from the top we could comfortably hear our local garden centre over 3 kms away. They use professional PMR446 radios, but we also heard domestic signals from a similar distance. 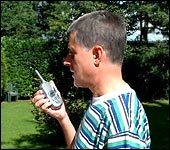 A check on the Internet revealed that not all consumer PMR talkie walkies are created equal and some perform better than others, despite government specified design limitations (power limit, no 'gain' aerial, etc). The talkie walkies have a VOX feature that starts transmitting once it detects your voice. Three levels of sensitivity can be set and we tried this in the car using the provided hands free ear/mic cable. Ambient noise caused transmission on the most sensitive setting, while the two lower settings required shouting to make it send. Best forget the VOX function then! Then again, it could function well as a baby alarm - just need the baby now. There's a scanning feature on the talkie walkie radios that continually scans all eight channels for a signal, and the LCD display illuminates briefly when a button is pressed. The display indicates when transmission or reception is taking place, battery charge state, channel, CTCSS code and volume level. We found a slight delay apparent when pressing the PTT and when using the CTCSS codes which resulted in missing the first few words of a message. But we quickly adapted to this by delaying speaking for a moment after hitting the PTT. Speech quality was 'loud and clear', except when talking close into the mic, then it sounded 'breathy'. A flimsy belt clip is provided, but we don't trust this so we purchased a couple of suitable soft carry cases which allows the talkie walkies to be carried over the shoulder. << The talkie walkie fits comfortably in the hand with the required controls falling readily to, er, hand. Using a CTCSS code isn't compulsory, in which case you may hear other users on the same channel. However, using this code doesn't ensure communication privacy and can cause reception to cut-out if a stronger transmission is in operation on the same channel. The LCD display indicates when a signal is being received on a channel, irrespective of any CTCSS code and a press of the monitor button will make audible all communication on that channel. We've seen some misleading advertising indicating '304 channels' - gained by multiplying the 8 channels by the 38 CTCSS codes. Ohhh, naughty! At the end of the day there's still only 8 channels! In the following year on our 2004 Scotland holiday we found the talkies to be a godsend in the cottage. The kitchen/conservatory distance was beyond shouting range, so the 2 way radios were ideal for Belinda to order a tea/wine/cider while Mike was slaving away in the kitchen preparing the evening meal! A slight irritation is the impossibility of standing the radios vertically owing to the rounded styling and one thing we noticed after a year's use was minor dust build-up behind the plastic over the LCD display. Placing a radio in the cat's basket and making cat sounds through it really winds up the cat up! The 2 way radios have a button lock, eg. to prevent inadvertent channel change, and the key tones can be turned off. An auto power off feature to save battery power if not used for a while is available as is a stopwatch timer. It's possible to use dry cells (or higher capacity rechargeable) in place of the pack provided as the talkie walkies take four standard sized 'AAA' cells. In this case it wouldn't be possible to use the drop in charger pod. The Binatone MR600 two way radios (or three way, four way or however many you wish) are a very useful communication method over short distances. However, that distance is severely limited by the low power and aerial constraints governed by the PMR446 licence free regulations. While our Binatone talkie walkies are adequate, there are undoubtedly better units around and if in the market again we'd do some more research before purchase. That's about it, Alpha Brava One over and out! It's 2010 - so no updates in six years? Er, no. We've not seen a need to update this review as the talkie walkies have largely continued to work as tested since our review. If pushed we could report that the dust build-up has continued behind the display, and the batteries don't last quite as long between charges, but that's about it! No failures and nothing's fallen off. However, our Binatone MR600 talkie walkies have become a bit battered in use so in early 2010 we looked to see what's available to replace them... ...and came up with the Binatone Action 950 two way radios - see our review. Review Centre - two way radio reviews. Radiocommunications Agency - PMR446 Information Sheet. TelecomsAdvice - Using PMR for businesses. © micbinks 2004. Please ask permission if you wish to reproduce any of our content.